Reelect McCrory – in 2018? 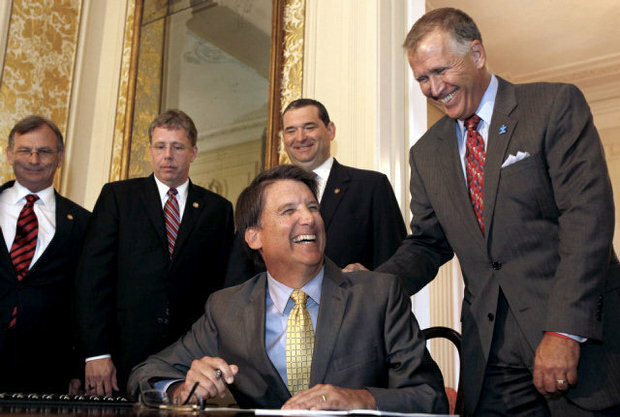 Constitutional amendment could extend McCrory’s term in office two years. North Carolina is one of only a handful of states that elects their executives in presidential years. For a number of reasons, most other states elect their governors during the midterms. One advantage of this is that the gubernatorial race is not overshadowed by the presidential race. State issues, not national issues, receive more focus. Of course, this has not been a problem for North Carolina and other states who elect their governors in presidential years. In the past, North Carolinians have been more than willing to split their ticket, most often opting for a president from the Republican Party and a governor from the Democratic Party. But things are changing. In 2008, the campaign of organization of Barack Obama swept Bev Perdue to victory in the gubernatorial contest. The nature of the electoral composition is changing too. In the past, the electorate during a presidential year and the electorate during a midterm year was not so different. Now, however, we have a dynamic where Democrats rely on a coalition of younger, more diverse voters, which is a huge asset to their party during presidential years but is much more difficult to turn out during midterm years. It’s not just the unpopularity of President Obama that has the political winds blowing to the right, it’s also the ‘midterm dropoff’ that Democrats dread. Republicans in North Carolina might want to take advantage of this by bringing the state more in line with the rest of the nation and electing state officers during the midterm elections. Not only would this protect Governor McCrory and Lt. Governor Forest by extending their terms until 2018, it would also allow the GOP to possibly make big gains in the Council of State. It would also give Republicans more of an advantage in future statewide elections, long after McCrory has left office. Such a radical change would bring about a lot of opposition, no doubt from Democrats who would consider this the Worst Idea Ever, a sentiment probably shared by many readers of this blog. To make this happen, there would have to be a constitutional amendment, voted on by the people, and to get it passed, the sitting governor would have to be popular – perhaps very popular. If Jim Hunt was unpopular back in the 1970s, he would not have been able to get the state constitution changed so that he could run again for a second term. Thus, a change like this is unlikely to happen any time soon. Republicans have enough on their hands without having to defend voter ID laws, and other election reforms. But Democrats should remain vigilant, just in case. The GOP have enough strength in the legislature to put an amendment on the ballot, and during a low-turnout May primary if they so choose. All they lack is the political will to do so.